A slight haze hangs over Bismarck on Thursday. The National Weather Service in Bismarck reports that fine particles from wildfires in western Canada are adding to the pollutants in the air. 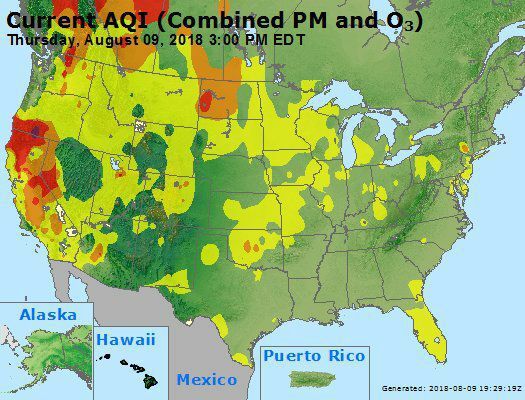 This map of Thursday's Air Quality Index from the Environmental Protection Agency indicates air that is unhealthy for sensitive groups in orange and unhealthy all in red. Patchy smoke from western Canadian wildfires may create hazy conditions throughout portions of North Dakota, according to the National Weather Service in Bismarck. The haze is expected to hang around at least through the weekend. A cold front Sunday afternoon might be enough to push it out of the area. The North Dakota Department of Health is urging those with respiratory conditions to limit outdoor activities. Particulate matter, small particles of ashes and soot found in the air, has been increasing over the past few days. High particulate numbers, coupled with hot temperatures over the next few days, could worsen respiratory conditions, such as asthma and COPD. Conditions are expected to remain hot and dry with a high of 98 degrees on Friday and 101 degrees on Saturday, according to the National Weather Service in Bismarck. Look for the possibility of elevated fire danger on Saturday and Sunday as winds are likely to increase with gusts as high as 22 to 24 mph. The fire danger in Theodore Roosevelt National Park was moderate on Thursday, according to Chief Ranger Dean Wyckoff. "I don't know about Saturday," said Wyckoff, adding that the rangers will restrict campfires if the fire danger level reaches very high or extreme. State parks follow the fire restrictions for the county where they're located. In the case of extreme heat, Wyckoff advised trail users to take precautions, carrying at least a gallon of water per person, wearing protective clothing and planning trips for the mornings and evenings. "We just want to educate people," he said.